Geothermal Power - Energy of the Future? Is Ancient Geothermal Power Really the Energy of the Future? Although mankind has been harvesting geothermal heat since the Paleolithic Age, first for bathing, then in the Roman Era, both for providing hot water for public baths and for heating the interiors of buildings, it is only since the late 19th Century that people have been tapping into Earth's geothermal resources in a systematic, meaningful way. This is odd, because our planet's innate thermal energy holds the potential for supplying all of Earth's energy needs, if it could all be harnessed. Though the truth is, much of it can't because of the expense of tapping into deeply buried sources of geothermal heat. The good news is just how much of it can be accessed to feed man's burgeoning energy needs as the 21st Century unfolds. Historically, geothermal power has been limited by the geology of certain regions of the planet, but recent advances in drilling hardware and other technologies have put geothermal power sources within reach that were previously unattainable. That's good news for the human race, since geothermal power is reliable, sustainable, environmentally benign, and, if implemented widely, can make a significant impact on the amount of greenhouse gases released into the atmosphere. While it's true that tapping into geothermal energy sources does release some greenhouse gases such as CO2, these gases are emitted at much lower rates than the gases generated by traditional energy sources such as coal and natural gas. This results in a net reduction of greenhouse gases for the amount of energy that's generated. And while tapping into geothermal energy is generally benign, it is not without some risks. A geothermal project in Basel, Switzerland was suspended in 2006 after it triggered earthquakes that a Swiss government study predicted would lead to millions of dollars in damage if the project continued. Still, if it is approached with the proper care, and the utility hoping to use geothermal power does due diligence, it can provide a safe, efficient, and nearly limitless supply of energy free of most fuel costs. In fact, if you pair up a geothermal energy source with solar and/or wind power to run the pumps and other equipment, you can create a power plant that will run virtually free of operating costs. One of the most attractive aspects of tapping into geothermal energy is its moderate costs. It compares favorably with the costs of producing fossil fuels like coal and oil, and in terms of cost per megawatt generated, geothermal power is far superior to nuclear power, to say nothing of avoiding the constant danger of meltdowns and accidents nuclear power plants present, as well as the prohibitively high costs of disposing of radioactive waste products that remain dangerous to human life for centuries. According to current estimates from the International Geothermal Association (IGA), geothermal power plants generate 67,246 giga-watts of electricity, which represents a 20% increase in the amount of power generated since 2005. The IGA is projecting that this power level will grow 18,500 mega-watts by 2015 because of the massive amount of growth this form of power generation has seen in the last two decades. As with any renewable energy technology, the driving forces have been the rising costs of conventional fuels, and a growing demand for cheap, sustainable energy. The really great news for Americans is that our nation is a leader in the production of geothermal power, with a total capacity of 3,000 mega-watts produced by 77 power plants nation-wide. The world's largest geothermal power facility (and also the oldest one) in the U.S. is located at The Geysers, a California geothermal field. Interestingly enough, because of its unique geology, the small country of the Philippines is actually the world's second largest producer of geothermal power, with a total output of nearly 2,000 mw. 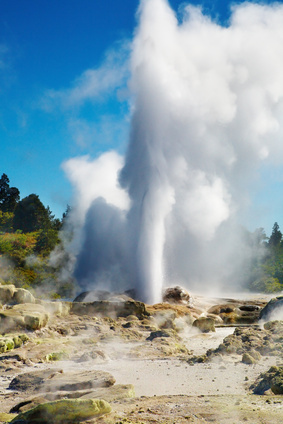 Geothermal energy accounts for between 27% of that nation's total energy output. The tiny island nation of Iceland generates 30% of its total power output from geothermal sources (more than any other country on Earth), which goes a long way towards making Iceland energy-independent, though of course the country still imports some coal and oil. The Central American nation of El Salvador of also boasts impressive geothermal energy resources, producing up to 25% of its power from geothermal sources. As oil supplies dwindle during the coming century, more and more countries will be exploring for new sources of power from the heart of the earth, or upgrading their existing geothermal power plants with deeper wells, more efficient pumps, and better infrastructure to disseminate the power gleaned from geothermal sources. In theory, at least, the heat produced by the earth through radioactive decay of certain elements and the residual heat still left from the formation of the Earth billions of years ago could supply the energy needs of the human race. According to a 2007 geothermal report financed by the Energy Department, advanced geothermal power could in theory produce as much as 60,000 times the nation's annual energy usage. Unfortunately, tapping the very deepest geothermal power sources can be extremely expensive. However, it should be noted that the human race already possesses the technological ability to sink deep wells and extract the heat buried under the Earth's crust. All that is needed is the collective will to provide the funds needed to tap into this energy source and send it wherever there's a demand for reliable, economical, environmentally friendly power.